St Mark is held to be the author of the Gospel of Mark, the first of the four Gospels to be written. 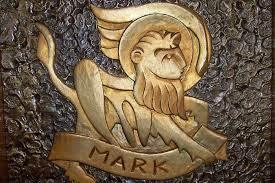 A winged lion is often used as Mark's symbol - showing how his Gospel bounds along with huge energy. He is believed to have become the first Bishop of Alexandria, and is hailed as the founder of Christianity in Africa. St Mark's Day is 25th April.